That’s right! I just cast my vote for Barack Obama-Joe Biden, Mark Warner, and Gerry Connolly. That’s one more blue vote in the state of Virginia! What’s up with those not so red anymore states? That seems to be the question on everyone’s minds. I live in one of them, Virginia. I actually just made what I assume is my last volunteer effort for the Obama-Biden/Warner/Connolly tickets today. A last minute literature drop on doors. Now this should have been quick and painless. It’s a door hang and you are out…however I didn’t make it till about 5:30 PM. UGH! Have you ever tried to find houses in the dark? It’s not a good time! We did manage to finish our packet, and I’m calling it a wrap. I hope it was enough. States to keep an eye on: Virginia, Georgia, and Indiana. All will have numbers out early. All three were thought to be Republican strongholds. Virignia is showing Barack Obama with about an 8 point lead (depending on your poll), and the other two states are close. We NEED one to go blue!! Two would be great! And three would mean I could pop open a bottle of super cheap champagne, drink a fair amount, go to bed, and then wake up on November 5th with a hangover, but delighted. So go vote Virginia! I want my home state to be the first “red state” to be a “blue state” tomorrow night!!! I’m off to do one last Obama-Biden/Warner/Connolly canvas. Dropping literature, reminding people to vote. Follow the link below to get involved! We need you! If you live in a battleground state, come on…change the world…one vote at a time! I liked the following video so much, I’ve posted it again! Watch it! Then get up off your couch and make some calls or do some canvassing!! I can’t believe we are 2 days out! Whew! I want to say a big thanks to Holly! This election ramp up has been all kinds of fun. First off, it’s been so great to share this experience with someone who feels as strongly as I do. Second of all, it’s be even better to be able to have that outlet for the frustrations, excitement, and journeys. Holly and I have: canvassed neighborhoods here in Springfield, VA, attended Bill Clinton’s rally for Obama at VCU in Richmond, VA, attended the Barack Obama rally in Leesburg with our girls, and most recently we went to see Hillary Clinton and Gerry Connolly speak at George Mason University right here in Fairfax County! Here’s some more rally photos! 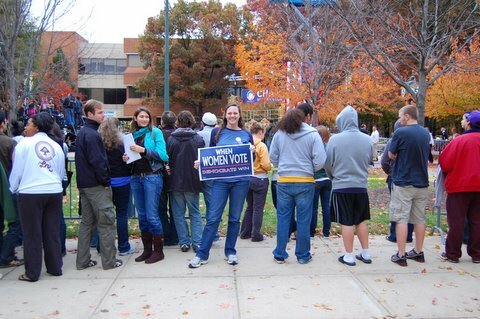 This is Holly holding the famous sign…When Women Vote Democrats Win! This sign has been with us since the VCU Rally!! 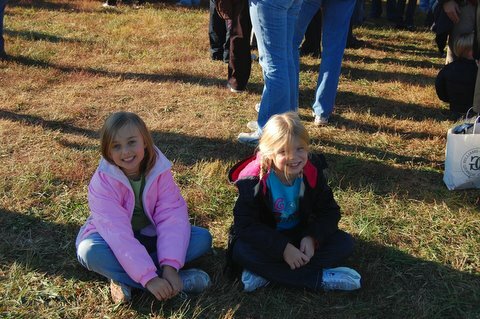 And here’s our future’s Vice President and President waiting patiently in Leesburg, Va waiting to get into the Obama rally. Em wants to be a “rock star” and Zo wants to be an “author of children’s books” and “dog breeder”, but I can always hope… Thanks to Hillary Clinton, the sky is the limit for future women! I live in Northern Virginia, you may remember it as not being part of “real Virginia”. However, it’s pretty real to me. It’s home! We have an open seat for Congress this year. Tom Davis (Republican) of Virginia’s 11th District is not running this year. Hip hip Hooray! If Mr. Connolly wins it will be the first time a Democrat has held this seat in over 40 years. These are exciting times for me! So I asked my mother today what she thought of my blog. She sat quietly, I could tell she was trying to find the right words. Exact quote, “You are really out there.” “A little sarcastic.” and then “You tell it like it is.” So I guess that’s mom’s version of a compliment! haha..sorry mom. Not much I can say except, yeah I’m a little sarcastic at times. And a little angry. Actually a little more than a little angry! So on a lighter note I took my eight year old daughter out campaigning with me this weekend. We went door to door for the Obama-Biden ticket, Mark Warner, and Gerry Connolly. I try to take her with me when I do this stuff for a number of reasons but the two main reasons are: 1. I work all week so I like to do activities together and 2. I want her to grow up knowing you can make a difference. At this point I think my head is going to explode. I’m quite sure there is steam coming out of my ears. I quickly wrap it up, hand her the literature, grab the kid, and stalk off. All the while telling my eight year old she may never get to watch tv again! I’m sure somehow Hanna Montanna is to blame for this behavior. I’m also thinking the lady at the door has to think I am a liar, I clearly have no credibility, my eight year old thinks I should shut up, and she’s definitely voting for McCain now. Sorry Senators Obama and Biden! What I’m thinking now is the Obama children are young…I wonder if they too have these funny moments with their children!